A digital firm is flying the Sheffield city region flag across the globe as the official marketing agency for an international campaign to build awareness of post-traumatic stress (PTS) currently touring across Australia. Mantra Media managing director Johnny Pawlik has flown out to Brisbane to join the #StandTall4PTS travelling military ‘Lightning Bolt II Invictus Convoy’ on its schedule of live events across Australia including awareness days, civic receptions, memorial ceremonies, and even an acclaimed British play. The Sheffield city centre-based business is handling all of the marketing for the major event, in support of the Invictus Games, including social media and live 24-7 streaming via website and Facebook. After just two days, the team’s social media reach had topped 120,000 people. 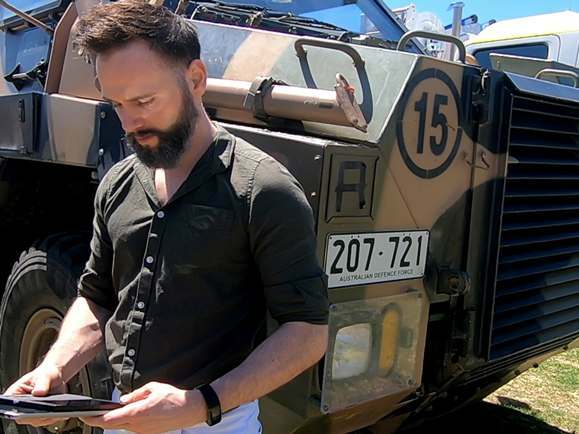 The three-week trip will see the convoy of tanks and emergency response vehicles travel through four Australian states and territories and 17 towns and cities including Canberra and Melbourne as well as Toowoomba in Queensland and Ballarat in Victoria, before finishing in Sydney. The team will also be carrying a large Invictus Games flag during the trip to collect signatures and messages from MPs and celebrities along the way before presenting it to Invictus competitors on the final leg of the convoy. #StandTall4PTS was founded by Vietnam Veteran and former Australian cricketer, Tony Dell, in 2011 after his own PTS diagnosis decades after he returned from the war. Johnny said: “I met Tony at a charity event in London earlier this year and he is a fascinating individual. Born in the UK, his parents moved to Australia and he is the last living person to have served in a war and been a Test cricketer. “The event was attended by a lot of charities who were all there to support this military campaign #StandTall4PTS which aims to end the stigma, educate the general public as well as encourage governments to do more. “I lost my grandfather far too young – he served in the army, including five years in Northern Ireland, and told me stories that were just horrific. PTS wasn’t really recognised then, but it affected every part of his life after he left the forces. My father served in the RAF in the 80s and fared a little better, although he also became a victim of PTS and faced issues and challenges as a result. “All of which meant I was passionate about doing whatever I could to support this campaign personally. I am proud professionally, too – as a Sheffield business handling the marketing for a global campaign like this, it’s putting the city on the map. It means a local firm is pulling the flag out and saying we are a global city with the talent, the ability, the skills and the creativity that goes along with that. The Invictus Convoy event officially launched with a PTS Awareness Day on September 30 at West’s Rugby Union Grounds in Toowong, backed by Brisbane City Council, and featuring a display of military and first responder vehicles. Other events planned in October include visiting Backtrack a centre to help troubled and homeless young people in Armidale, New South Wales where the #StandTall4PTS team are expected to meet the Mayor of Armidale. A media conference will be held at Dubbo Zoo in New South Wales, the local Young Veterans group and Vietnam Veterans are organising an event for the campaign, and British production Shell Shock – about a soldier coping with the symptoms which can lead to PTS – will be performed at the Dubbo Returned and Services League Club. There will also be a civic reception in Canberra, and a ceremony at the Australian War Memorial. The Last Post daily ceremony honours the fallen where the team will be joined by David Forbes, the head of Phoenix Australia, and a number of local celebrities and politicians to lay wreaths. The final leg of the convoy will see the team head to Homebush and Parramatta on October 19, where the majority of the Invictus Games will be held, to present their flag and be welcomed by the Parramatta Mayor and the Returned and Services League Club. Mantra Media was set up by Johnny with business partner Masatsugu Kuno, who runs the Japanese offices, in 2015. The firm works with clientele in four continents from North America and Europe to South Africa and South East Asia, delivering digital marketing for businesses, charities and third sector organisations across the globe.